More than 200 children drown in backyard swimming pool accidents every summer. While having a backyard swimming pool can make your home a summer paradise, understanding a few simple swimming pool safety tips will help keep everyone safe. The five tips below are important to implement at your home pool to prevent accidents. Anyone who owns a swimming pool should take preventative measures to keep the area secure. Installing a 4-foot tall fence around the swimming pool prevents children from accessing the area when an adult isn’t around. Along with the fence addition, add a swimming pool cover to prevent accidental falls into the pool. Children under 14 years old should always be supervised when in the backyard swimming pool. Teens need monitoring as well, but it is essential that you keep your eyes on small children at all times when they’re around water. It takes under a minute for drowning to occur. Going inside to grab a drink or answer the phone could be disastrous, no matter how quick you think you’ll be. Teach your kids how to swim! This is one of the most important swimming pool safety tips for kids and helps reduce the risk of accidental drowning. Many community organizations offer low-cost swimming lessons if you aren’t comfortable teaching the kids yourself. 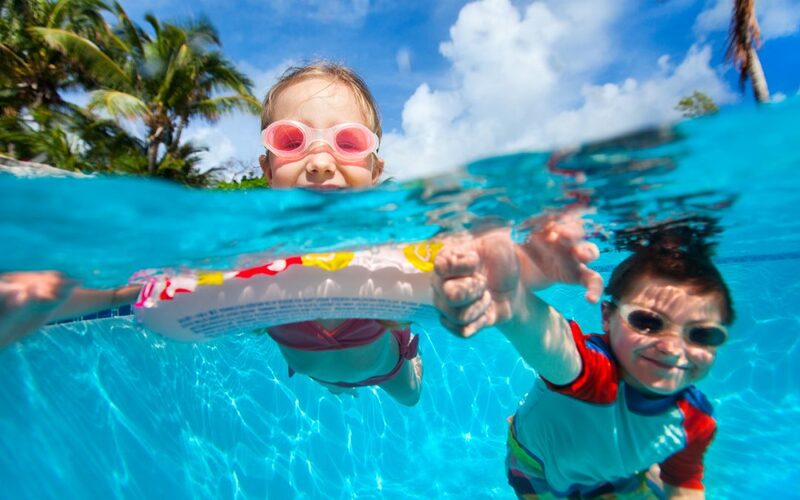 Make sure children know that the swimming pool can be dangerous if it is misused. There should be clear swimming pool rules posted and boundaries set for kids of all ages. Stay away from pool drains, no running, and no diving in shallow water are some examples of rules that should be established. Make sure that all that the adults in your family become CPR-certified and are trained in what to do during an emergency. Always keep your phone close by. Make sure the swimming pool area is equipped with life-saving safety equipment before anyone takes their first jump into the water. There are several items that you can use to promote the safety of everyone at the pool, including a rescue hook, floatation devices, mesh pool covers, and more. These items are available to buy online at various retailers and at swimming pool stores in the local area. Costs vary but are worth the small expense for the protection offered. Nothing is more exciting than enjoying the swimming pool in your backyard when summer rolls around, but without the right safety techniques in place, the fun can take an unfortunate turn. Use these swimming pool safety tips and reduce the chances of having an emergency at your pool. Coast to Coast Property Inspections provides home inspection services to South Florida. A swimming pool inspection is included in our residential home inspection. Contact us to schedule an appointment.